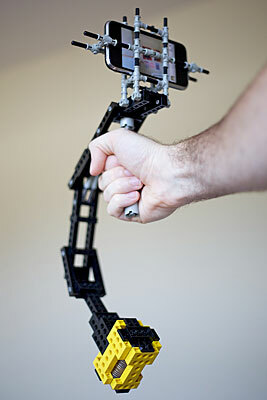 Lego iPhone steadicam - yes, really! 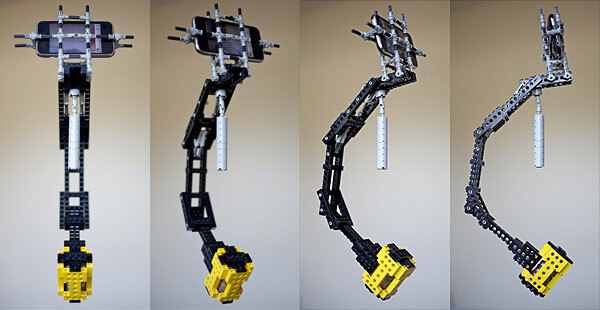 Lego iPhone steadicam – yes, really! After watching some very jerky video footage of the kids I’d taken on my iPhone recently and knowing a little bit about how camera stabilisers work, I wondered if anyone had made one for the iPhone. It turns out they have! Tiffen, the company behind ‘real’ Steadicam, announced in January that they are bringing out a model designed specifically for iPhones, called the ‘Smoothee‘. There’s no pricing yet but considering their next cheapest option costs $1295, I assumed it was going to be beyond my budget. It was at that moment that I noticed the tubs of old Lego lying on the floor in our bedroom, having just been retrieved from storage. Inspiration struck! Three words of geek perfection ‘Lego… iPhone… Steadicam…’ The obsession began. Over the next few weeks I set about perfecting my design, getting the balance right, the attachment mechanism, the colour scheme (critical). Finally my creation was complete and ready for use, while I was keen to bask in the glow of my amazing skill. Unfortunately, this story has a sad ending. I forgot to take one small thing into account when setting out on my quest – Lego is plastic and fairly flexible. Not only did every video I shot contain almost as much wobble as it did without my creation, but the audio was filled with little pops and cracks as the Lego flexed and clicked against itself. Perhaps this can be resolved, but I’ll leave others to pick up the challenge. I’ve gone far enough. I recommend that if you really want steady iPhone video (which almost seems an oxymoron), save your money and buy the Smoothee when it comes out.